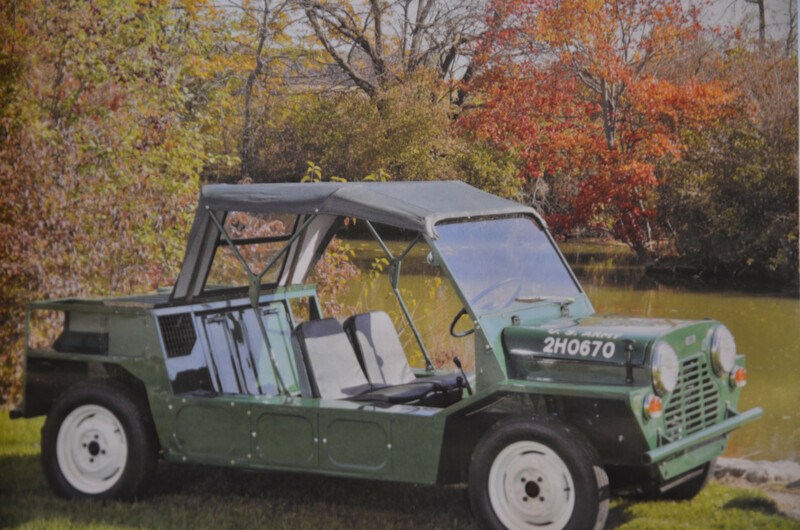 Yes, this famous twin motored Moke is now restored and in Ohio. It will be at the Mini Meet East 2017 https://sites.google.com/site/minimeeteast2017/ , on Friday, June 30th 2017.
cheleker wrote: Ah. Mokes. Early Mokes. Dear to my heart! Thanks for the photos. Has the Moke been finished enough to run on both engines? Well, yes and no. Both engines run. Both engines will run the Moke. Just not at the same time. The owner/rebuilder has a large truck business and does leasing and service of these trucks. He has mechanical experience and does nice clean work. He replaced some motor controls with straight metal rods and rose joints. Works very well independently. He doesn't know how the factory ever got both engines and gearboxes working together at the same time, and actually thinks it was never done. Anyway, that's where it was this past summer. Perhaps some further tweeking has happened to rectify that situation, but I do not know that. Ah. Mokes. Early Mokes. Dear to my heart! Thanks for the photos. There has been an article written about the discovery and restoration of SPL 935 that appears in the Feb 2017 (if memory serves well) issue of "Moking" magazine, a publication of the Mini Moke Club in the UK. Someone there should be able to get you a copy. Mokes, especially the very early ones, are a subject dear to my heart as many of you know. I am delighted to see that this Twini sent to the States for evaluation by the US Army has survived and better still has been restored to a high standard. What I would love to know is the story behind the Twini being discovered and restored. Has an article on it appeared yet? With regards the other Moke do we assume that it did not survive? One very awesome car. Thanks for bringing it to Columbus for the show. I didn't get to spend nearly enough time to take it all in. Won "Mini I would most like to take home", otherwise known as Best in Show.